Roaring into 2017: a reborn Suzuki T500 Titan cafe racer, a naked Ducati Panigale, and Christini’s new snow bike—complete with tracks front and back. We’d happily put all of them in our garage. 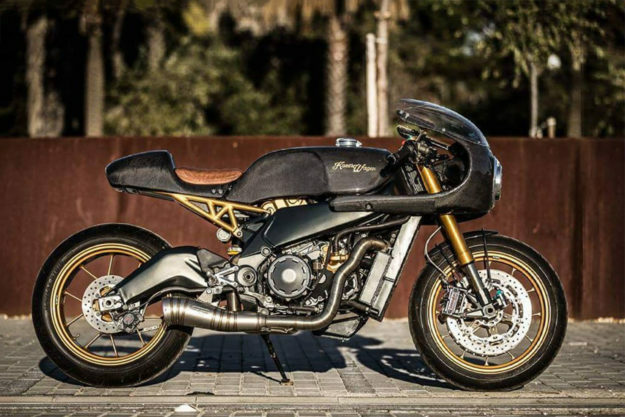 Ducati 899 Panigale by Benjie’s Café Racer It’s a slightly less dangerous weapon than its bigger brother, but in capable hands the Ducati 899 Panigale is still as sharp as a scalpel. Hitting the track can be a tricky proposition, so the lads at BCR decided to go with a more upright route for this former weekend warrior. 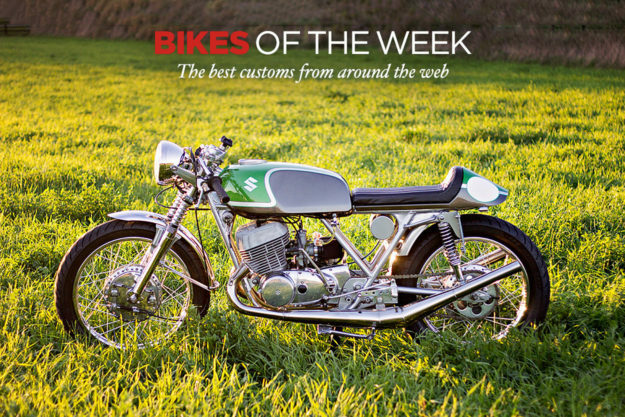 Suzuki T500 by Steve Baugrud With an ability to run the ton (somewhat under the radar), the Suzuki T500 Titan remains a high water mark for big-bore, two-stroke engineering. Its excellent road manners and low-end grunt helped the oil burner snag victories in the 500cc class on the Isle of Man. Twice. 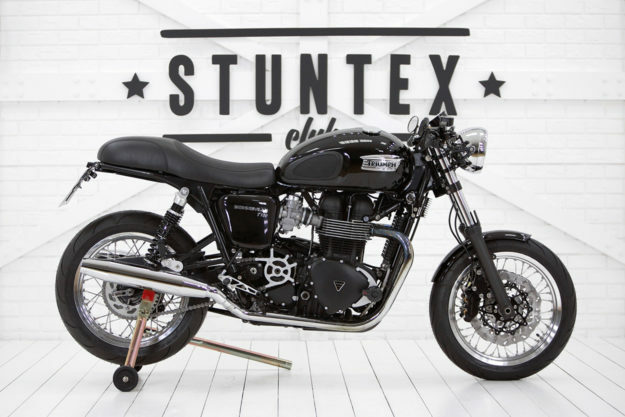 Triumph Bonneville T100 by Stuntex Club Subtlety is a lost art. A product of our times, builders often try to make the sizzle speak for their steak. Performance takes a back seat to style. Handling is compromised for stance. And niceties (or necessities) like fenders, fill scrap heaps because the insta-crowd aren’t fans. Bucking that tradition, this T100 from Podolsk, Russia’s Stuntex Club is simply sublime. From a distance, most would figure this cafe’d Bonnie was simply a Thrux. And that it was damn near stock. Sure, they’d pick up on the new LSL Clubman Seat but nobody would spot the shortened 43mm KYB forks up front. They aren’t a USD set-up like most custom jobs, but they shed weight and add performance. As do the twin floating discs clamping down on the rebuilt, spoked wheel that was mounted on an SR500 hub to make the system work. Out back the hub is stock, but the alloy is again all new. Aprilia RSV4 by Kacerwagen Just before Christmas, Aprilia pulled the wraps off its civilian-duty MotoGP racer, the RSV4 R FW-GP. It may be the finest 250-horsepower expression of Italian excess we’ve ever seen, and even comes with an on-call race engineer. But if you’d rather save a few bucks and land an even more unique Aprilia, we think we’ve found your best option. 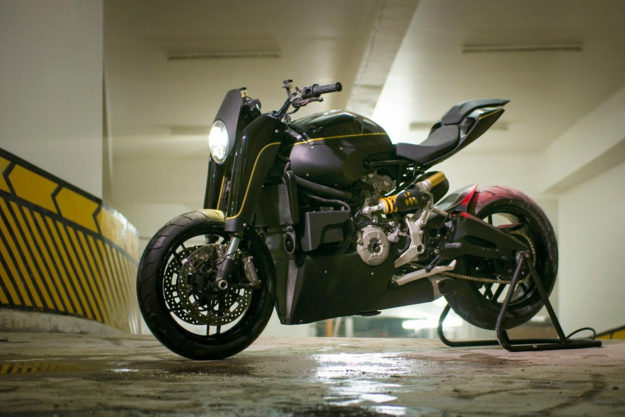 Created by Chus and his team of builders from Kacerwagen, this Aprilia RSV 1000 is a modern beast with a vintage vibe. The obvious standout is the exquisite carbon fiber bodywork: Working from clay models, the team carved and honed until they’d found the right shape and flow. The result is a mesmerizing, high-lacquered weave that rivals the finest we’ve seen. 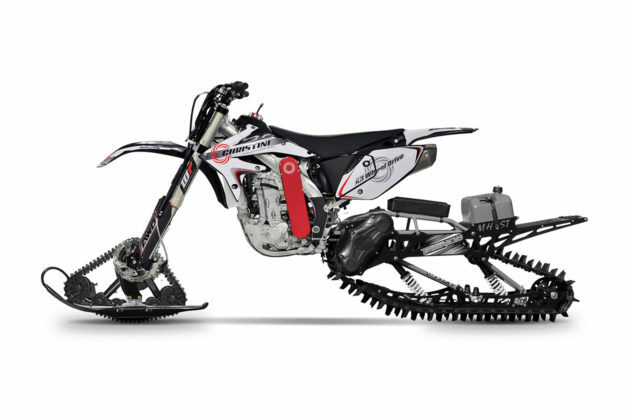 Christini II-Track snow utility bike I’m sure it helps that I live in The Great White North and can only stare longingly at my winterized rides—but there’s something about a snow bike that makes me feel like a ten-year-old mainlining Pixie Stix. 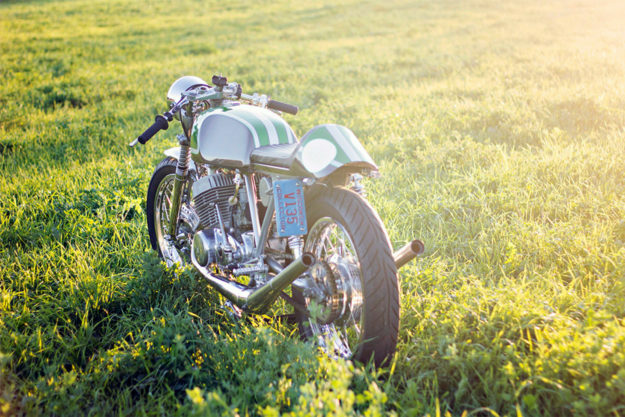 And while it isn’t exactly custom, this latest release from Christini All Wheel Drive Motorcycles is truly something sweet.